He emptied his bank account, and all he has is this Rasta banana. 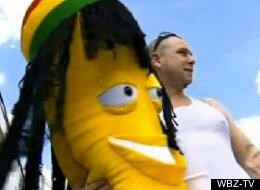 Henry Gribbohm, 30, has filed a police report after he says he lost over $2,600 on a carnival game and won only a stuffed banana with dreadlocks, WLKY reported. The Epsom, N.H., man attended a carnival in Manchester on Saturday where he played a ball-tossing game called “Tubs of Fun.” Gribbohm told WBZ-TV his goal was to win an Xbox Kinect for his kids, but after spending $300 on the game without success, he went home to get another $2,300 — all of the money he had. “Tubs of Fun” costs $5 for two balls, according to the New Hampshire Union Leader. The player must throw the balls into a tilted bucket. He returned to the carnival, run by Fiesta Shows, the next day to complain, and the game operator gave him $600 and a large stuffed banana with a hat and dreadlocks. The operator said that was “all they could do” for him, Gribbohm told the Union Leader. Gribbohm contacted Manchester police, and the department is now investigating to see if any fraud occurred. Investigators have not been able to locate the employee who was running the game when Gribbohm played, though Fiesta representatives told authorities that Gribbohm did not spend $2,600. Fiesta Vice President John Flynn told WBZ-TV that “Tubs of Fun” is run by an independent contractor. He noted the company has worked with Fiesta for years, and they have never run into a problem before. According to the Union Leader, a book called “Carnival Fraud Investigations 101″details how the “Tubs of Fun” game fools patrons: A carnival employee places a ball into the bucket, then invites potential players to toss one in. With the first ball weighing the bucket down, the practice ball stays in the bucket easily. When the game begins, however, the employee removes both balls, and without the weight of the first ball, most tosses bounce out of the bucket.